The $2 million Sentient Breeders' Cup Sprint (G1) features top sprinters going 6 furlongs on the Pro-Ride main track at Santa Anita. 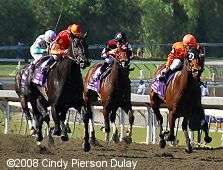 Just 8 went to post (after Cost of Freedom scratched the day before), with local hope Street Boss sent off as the 2-1 favorite, off wins in the Los Angeles, Triple Bend, and Bing Crosby handicaps before finishing second in the Ancient Title last time out. In to challenge the Bruce Headley stable star included 2007 Sprint winner Midnight Lute at 5-2, coming off a distant 10th in the Pat O'Brien, and 5-1 third choice Fatal Bullet, coming into this race off a 3-race win streak which included the Bold Venture at Woodbine, the Tom Ridge Labor Day Stakes at Presque Isle Downs, and the Kentucky Cup Sprint at Turfway Park. Down the stretch with Fatal Bullet out front and Midnight Lute closing on the outside. 12-1 First Defence was quickest away under jockey Javier Castellano to get the opening quarter mile in 21.28 but he was soon passed by Fatal Bullet to his outside nearing the end of the backstretch. Fatal Bullet opened up a clear lead of 1 1/2 lengths on the turn, getting the half in 43.85 and 5/8 in 55.14. In mid-stretch he looked home free, but Midnight Lute, who was slowest out of the gate and 5th entering the stretch, blew right by everybody through the stretch to win going away by 1 3/4 lengths in a time of 1:07.08. It was another 1 3/4 lengths back from Fatal Bullet to late-running favorite Street Boss third. 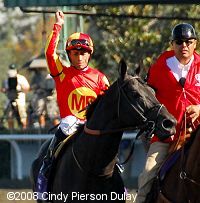 This was the fourth Breeders' Cup win for jockey Garrett Gomez over the two days of racing. 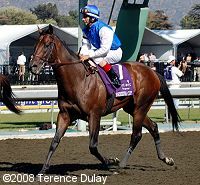 His other wins were in the Filly and Mare Sprint aboard Ventura, the Juvenile aboard Midshipman, and the Dirt Mile aboard Albertus Maximus. 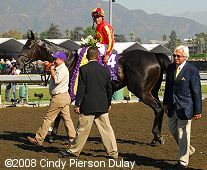 Left: Midnight Lute checks out the photographers as he heads for the winner's circle. Winning jockey Garrett Gomez said, "When I left the gate, I dropped my hands and he just relaxed. It was like, Okay, this is what I've been looking for. And I was actually just waiting on David to see what he was going to do on the horse in front of me. He sat there on the inside a little while. When I thought it was time to get him up on his feet, I got him up on his feet. Once you get him moving forward, like I said, he's like a runaway train. And he just covered so much ground. It was just like, keep everybody out of his path. Give him a free path. And you're not worried about the ground you're losing, because once he gets up on his feet, his stride is two of theirs." 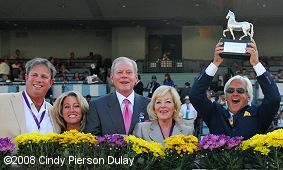 Right: The trophy presentation with owners Mike and Mary Ellen Pegram, Paul and Betty Weitman, and trainer Bob Baffert. Mike Pegram said, "I said back in March, Bob, you've got plenty of time to make the Breeders' Cup. That's the reason why you've got white hair and you're the best. But I will tell you this, you asked the question about whether he'd be retired. 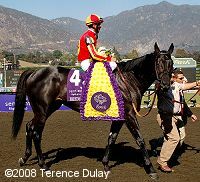 None of our mares are booked this year, so I think Midnight Lute will be happy in the support he's going to get in the stud barn." 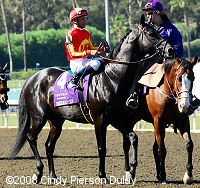 Left: Midnight Lute in the post parade. Right: Midnight Lute circles with his flowers with trainer Bob Baffert on the right. Baffert said, "He is such a great horse, and he came back. And Garrett said there's no telling how good he is. He looks green. I took the blinkers off of him. He made the lead and he was looking around, and that is the way, in the paddock, he was looking scared of the cameras that were going back and forth. But this is a beast. I've never had a horse as massive, beautiful, big horse. And his body is like the perfect thoroughbred, and to be by Real Quiet is amazing. Real Quiet put Mike and I through the best times of our lives. It's meant to be that we all hooked up together with this horse. This is why Mike and I and all of us are in the business, to compete at the top level. This is the greatest horse I ever trained." Left: Jockey Eurico Rosa da Silva looks pretty happy about his second place finish aboard Fatal Bullet. da Silva said, "He broke real well. He was running comfortably and was running strong, and I didn't want to get him boxed in. He ran his best race ever, and this is the first time he has ever run in this kind of heat." His trainer Reade Baker added "You run in 1:07 2/5 and get beat. He couldn't do any better. We might have gone a little early, but what the heck. He's a really nice horse." Right: Third place finisher Street Boss in the post parade. His jockey David Flores said, "When I got to rolling (on the turn) there was all sorts of traffic in front. I didn't want to take a hold of him. He's such a big horse you don't want to do that, so I looked for the best hole I could see. I had to ease out and ease around. When I did I saw that big horse (winner Midnight Lute) outside me. He was running free and easy. Then he was gone." 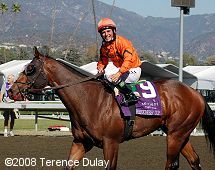 His trainer Bruce Headley added, "He ran well. We had the inside, which is a little disadvantage, and those other jockeys worked it to him. Then he seemed to be just trapped. 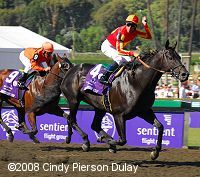 But Midnight Lute ran a great race, 1:07 flat. 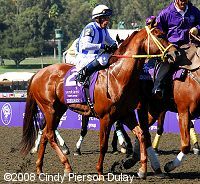 He's a Breeders' Cup champion before and he showed it again today. This horse ran a good race, but just didn't win." Fourth place finisher In Summation returns after the race. His jockey John Velazquez said, "He ran well. He just needs everything to be perfect if he's going to win. At the quarter pole, we got surrounded and he sucked back out of there. I knew I couldn't win then. But those three in front of us are all good horses. That's for sure."